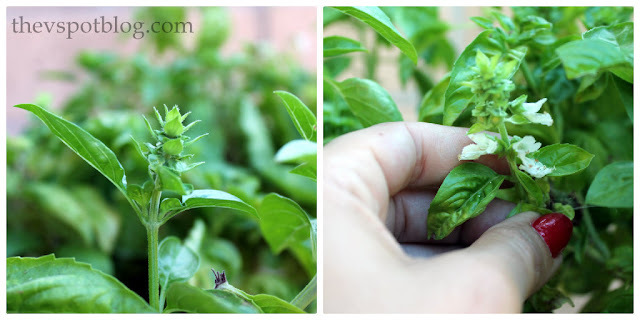 Did you know that basil will root in water? I didn’t either. If you take a few cuttings of fresh basil and just keep them in water, they will send out some roots. I waited until there was a large mass of roots, then simply (and gently) placed them into a pot with soil in it. I added more dirt and lots of water. He’s a teeny, tiny bit shell-shocked, but I think he’ll perk right up. By the way, be sure to pinch off any of the little flowers and buds when you see them. This is called bolting and you don’t want your basil to bolt. The plant’s energy goes into growing the flowers instead of into the delicious leaves, and they become a little bitter and not as green. 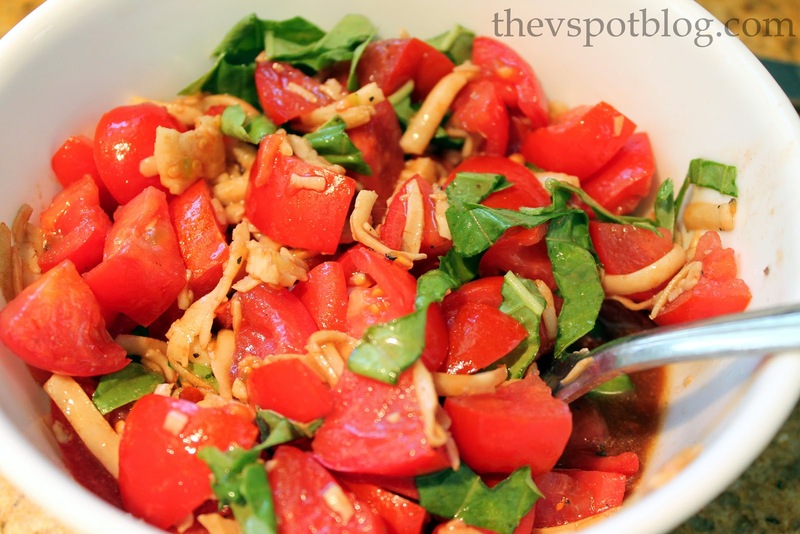 Get the recipe for this tomato, basil and mozzarella salad HERE. Love it Viv! I never knew this! I have 2 kinds of basil, regular and a new bush type of basil. 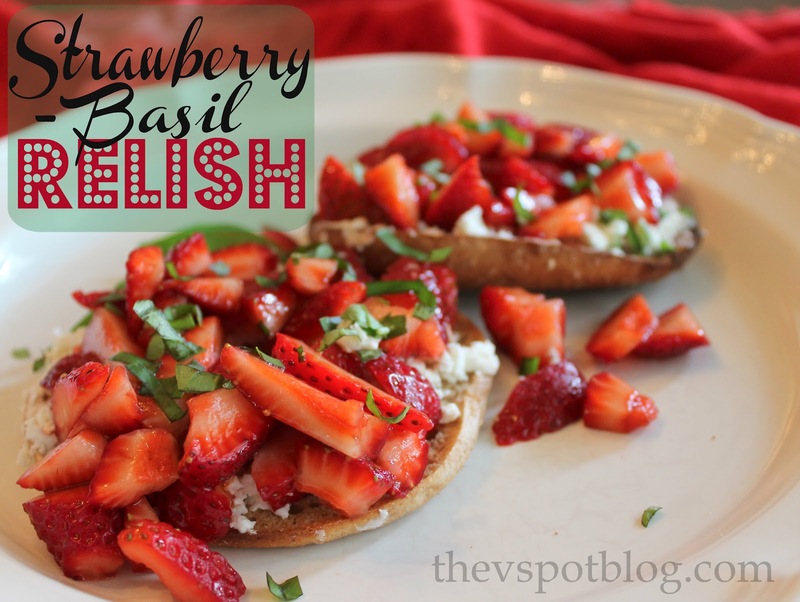 They taste the same but the bush grows… well, like a bush! It seems hardier too. I’ll try this with both. I’d love to have fresh basil all year round. Thank you for this post! I had no idea about the bolting thing. I planted a basil next to my mailbox and it’s huge now. Will go out now and pluck off those pretty little flowers. I LOVE basil! I want to try this method of growing it! I discovered this when after I picked some basil to dry and put it in a vase for a few days. Unfortunately, the water dried up before I could plant the basil. How long did it take to get the roots that large? Thanks for sharing this!Stopping by from Inspiration Friday. i always have success growing basil. i love it. great tip, chica! 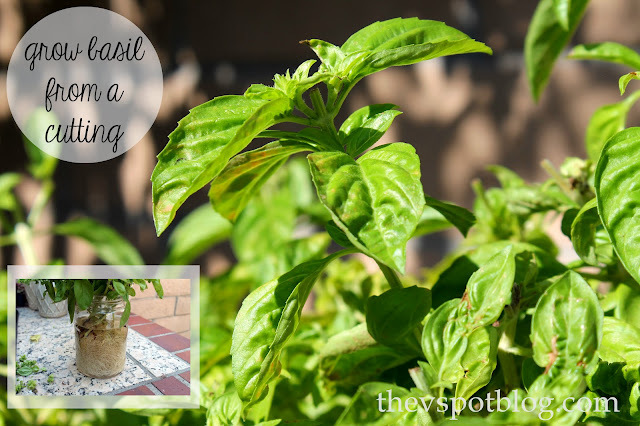 I’m with everyone else – I had no idea you could grow basil from cuttings!! ( I also didn’t know to stop it from growing flowers – so there’s my black thumb showing.) Thanks for the tips!! Great post, I never knew how this worked! Thank you! I grow a lot of herbs from cuttings… but never basil! Love this Viv! I thought I had to suffer through winter without “fresh” basil. Looks like I’ll be saving some cutting before the frost hits. Thanks for the tip!